We have launched a campaign to help pay for an exciting project which will transform us one of the most innovative digital arts venues in England. Our Digital Futures aims to raise £20,000 that will help the centre unlock the £500,000 that has been pledged by the Arts Council England, and strengthen applications to several charitable trusts that are currently underway. 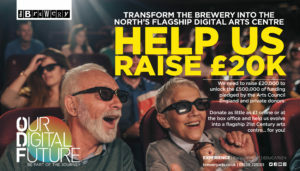 The money needs to be in place during 2019 when, if successful, work will begin to completely upgrade the Brewery’s cinema screens, create a digital learning hub with state of the art equipment and a dedicated new space to exhibit cutting-edge digital art from around the world. The project aims to make the Brewery a flagship 21st century arts centre with the latest technology and cutting edge venues. As a whole, the scheme will transform the visitor experience for film, festivals and digital art, open up innovative opportunities to connect with new audiences online via live streaming of events and offer exciting new ways to participate in the digital arts, film and visual media. The installation of energy efficient LED stage lighting throughout our performance spaces. A successful campaign to raise £20,000 from the public during 2019 is a key milestone in unlocking the funding from Arts Council England and other trusts and foundations. “Indeed, one of the reasons we called the campaign Our Digital Future is to emphasise that this project will ultimately benefit everyone in Kendal, giving them cutting edge facilities worthy of an amazing town like Kendal, where innovation and creativity have always been important. With the Our Digital Future campaign in full swing there has never been a better time to be a Brewery Membership. Join before the end of July 2019 and take advantage of attractive additional incentives. Please help us to continue our ground-breaking work by making a donation online now. The new Brewery membership scheme offers fantastic benefits, including money off cinema tickets, priority booking for live events and even a discounted food bill at our popular Grainstore restaurant.